After losing their son to the war, a Berlin couple begin a secret rebellion against Hitler. Over the next couple of years we're set to see dozens of movies set during WWII hit our screens. The reason for this trend is unclear. Some thinkpiece writers may wish to connect it to the rise of Trump, but the less dramatic truth is most of these movies went into production long before the divisive POTUS announced his candidacy. I worry that WWII is attractive to mediocre filmmakers as a setting because its black and white morality allows for lazy storytelling and narrative shortcuts. 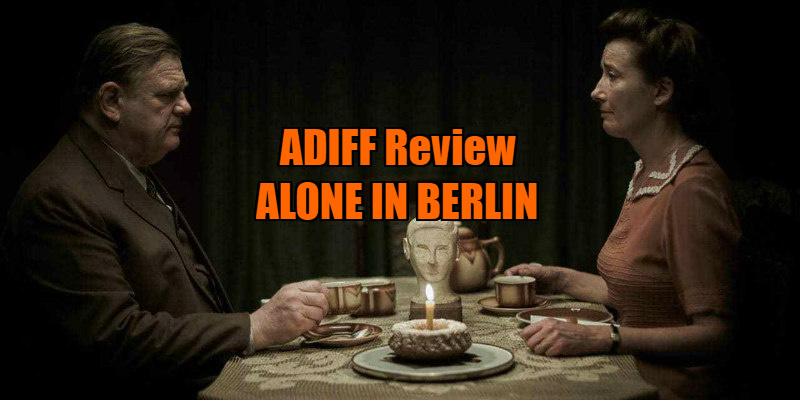 Vincent Perez's Alone in Berlin does little to allay such fears. Based on the actions of real life couple Otto and Elise Hampel, Alone in Berlin opens in 1940, with Otto (Brendan Gleeson) and Anna Quangel (Emma Thompson) receiving news of the death of their son, killed while fighting for Germany in France. Angered at his only child's senseless death, Otto begins writing a series of postcards sporting anti-Hitler messages, distributing them across the city in the hope they will be passed around by those who find them. With half of Berlin fully supportive of Hitler and the other half paranoid about having their true feelings exposed, most of the cards are handed into the authorities, and an investigation is undertaken by police inspector Escherich (Daniel Bruhl) to find the culprit. 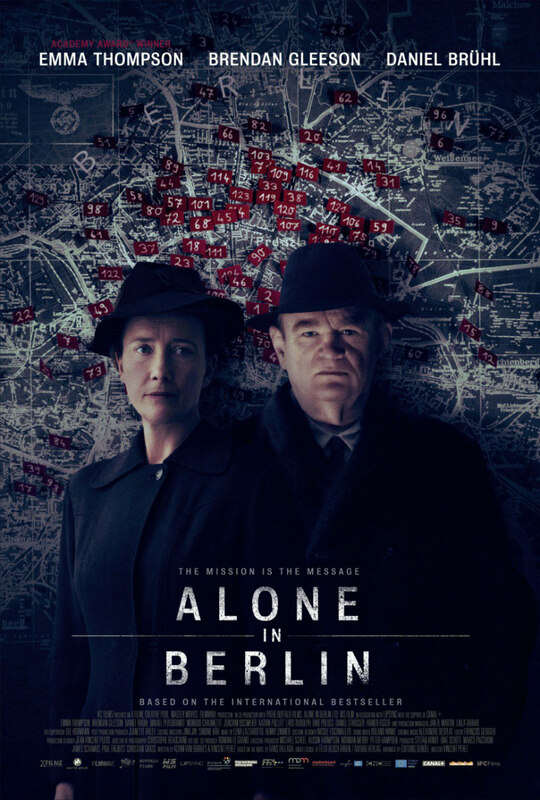 Alone in Berlin may be based on true events, and adapted from a 1947 novel by Hans Fallada, but I couldn't help draw comparisons with Bob Clark's 1985 drama Turk 182, in which Timothy Hutton's graffiti artist embarks on a campaign to discredit the New York authorities. Perez's film lacks the energy and narrative thrust of Clark's film however, and crucially it's missing protagonists we can fully throw our support behind. The motives behind Otto and Anna's rebellion are murky. It seems they were supportive of the war until the death of their son, so it's not so much Hitler's beliefs they're angry with as his methods. Had their son survived, would they happily sit back and enjoy the temporary spoils of Nazism? There's little here to suggest they wouldn't, and as such it's difficult to empathise with their arguably hypocritical anger. There's little in the way of characterisation afforded the Quangels, as though simply aggravating Nazis is enough to make them interesting. It's not. Even more confusing is Bruhl's police inspector, whom the film seems conflicted about, giving him a heroic denouement despite showing him previously committing a series of atrocities with little in the way of conflict on his face. Though it's a pan-European production, Alone in Berlin feels very British, and in the worst possible way. It has the bland look of Sunday night UK TV drama, and Gleeson and Thompson are miscast, never convincing as Germans. The Hampels' story is one worth telling, but it's probably best told by a German, as it was in Alfred Vohrer's 1975 version of the tale, Everyone Dies Alone. Alone in Berlin played at the Audi Dublin International Film Festival. A UK/ROI release date has yet to be confirmed.